Steven (Chicagoland, United States) on 4 November 2015 in Transportation and Portfolio. 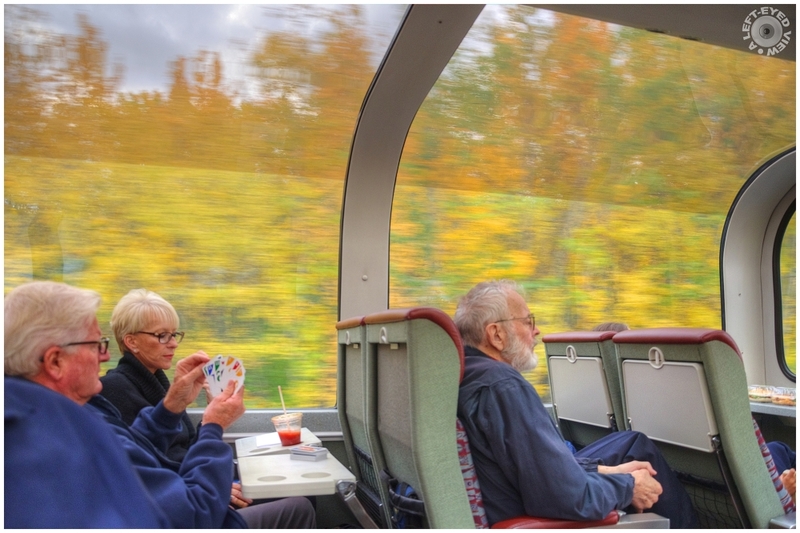 Passing by some autumnal colors on the glass top train as passengers enjoy a game of cards. It seemed autumn passed just as quickly as Alaska's autumn season is very short. It seems that Autumn watches these passengers very well. Excellent and beautiful colors. Love the blur of autumn colour - the passing of time itself. Fantastic view ! Very nice train. An interesting shot. Well done. Pleased to let you carry. The glass topped train has wonderful visibility. With the train's speed I can imagine that fall passed by rather quickly. such beautiful frame, colors, lights & movement! Love the way the colors show the movement. A lovely shot of the colors whizzing by the window. I like the idea of this train excursion. These warm tonalities are a wonderful backdrop for the scene. They should enjoy the landscape instead of playing cards :)) ... The colors and the effect of the movement are wonderful !!! Ah yes, pay thousands for a scenic trip, then stare at some playing cards. I love the colorful blur outside the window. The windows are so expansive. I cannot believe that they are playing cards! The man in the front seat looks like he is sleeping! A very nice view of the quiet card game while the world rushing by at a breakneck speed. Great idea. I do love the motion sensation.